NIA CHARLESTOW NEVIS (May 28, 2015) –– Junior Minister in the Ministry of Communication Works and Public Utilities Hon. Troy Liburd urged residents of Nevis to be conservative with their water usage, as the island like others in the region, is experiencing an extended dry season. 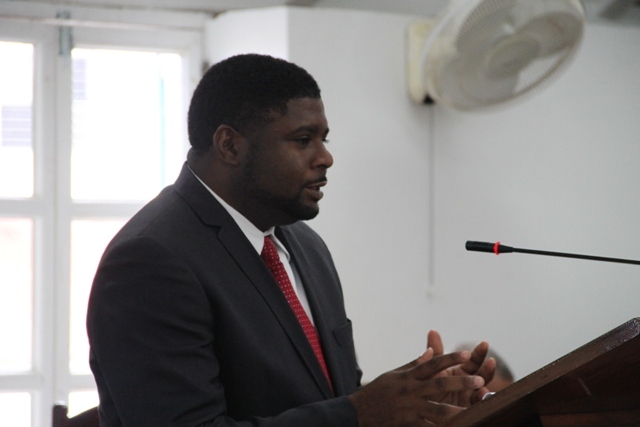 The Minister was at the time making a presentation at the May 27, 2015 sitting of the Nevis Island Assembly and gave an update on the existing water situation on the island. “I want to call on the general public to do as much as you can to conserve water because we are going through a dry spell and water is important and at this time it’s a little bit scarce. “I would ask that we try to cut down on the wastage and observe good general practice in usage of water. Conserve as much as possible. Take maybe shorter showers; be more precise about the watering of lawns and gardens and so on,” he said. Mr. Liburd also thanked the public for being patient and asked them to continue to do so as the Nevis Water Department is on the field 24 hours a day ensuring that the best possible service is available to the people of Nevis.